The breed is auto sexing with distinct color differences between males and females at hatch. Newly hatched ganders are a light yellow and the geese are grey. 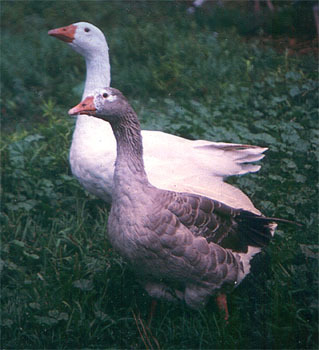 Adult ganders are white, geese are grey, both sexes have a knobless orange bill, orange feet and legs, with the adult size weight being roughly 14 lbs.